(Durham, NC) - August 30, 2018 - While the island of Puerto Rico is some 1,500 miles from Downtown Durham, foodies in the Bull City will have the opportunity to grab a popular taste of fusion Carribean cuisine based heavily on PR classics. Boricua Soul, a Puerto Rican soul restaurant, will launch as the second tenant of the PopUp @ American Tobacco space after a successful two-week run by Venezuelan Coffee purveyor Caballo Rojo. Boricua Soul is the product of husband and wife duo Toriano and Serena Fredericks. Both have drawn on their multi-ethnic and rich culinary ancestry to create unique flavors that have most recently been found in their food truck by the same name. The restaurant (and truck) specialize in using West African, Native Indian and European ingredients and techniques as a result of the African slave trade. According to Toriano and Serena, these foods tell the story and act as a vehicle to transport history from the past. This will be their first go at a brick and mortar location. 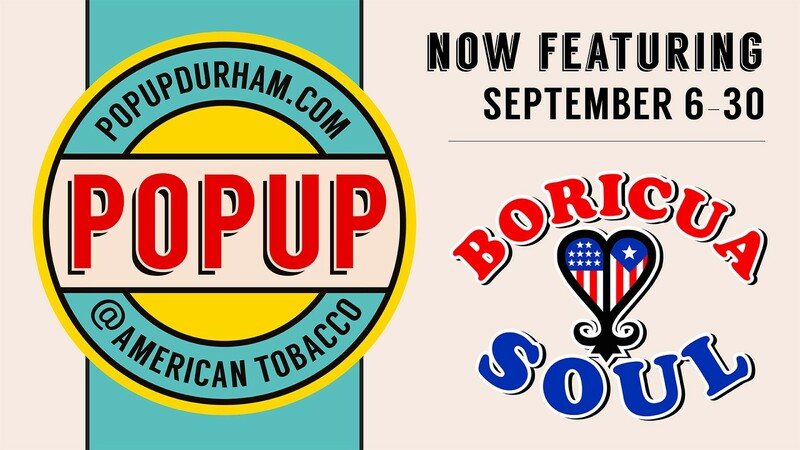 Boricua Soul will occupy PopUp @ American Tobacco from September 6 - September 30. September also marks the one year anniversary of Hurricane Maria which devastated Puerto Rico with effects still being felt today. To support the island, Boricua Soul will donate 10% of their sales on 9/20, the date the hurricane made landfall, to United for Puerto Rico. Boricua Soul will welcome Durham’s hungry lunch crowd Monday through Friday 11 a.m. - 2 p.m. They’ll be open for dinner on Fridays from 5 - 8 p.m.